The X16 Analog Interface Module or Cordless Telephone Module enables the connection of a standard cordless telephone to your X16 system for a fully integrated X16 system extension. It also works with other standard phones such as conference room speakerphones. The Cordless or other standard telephone user can Answer, Originate and Transfer calls, and use other popular system features like Hold, Pickup, Conference & Call Forwarding. Each Module provides a Voice Mail Box for each connected phone. Simple, Do It Yourself installation is made possible with Standard Telephone Jacks and user ready default settings. 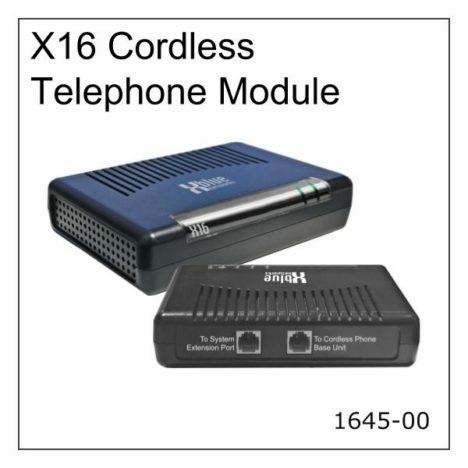 Purchase additional Cordless Telephone Modules for each cordless telephone you wish to add to the X16 system. Up to 4 modules may be connected to the system.